Our range of products include decorative tassel, tassel and beaded tassel. Size 6.7cms. & Loop 2.5cms. Size Tassel 6.7cms. & Loop 2.5cms. Size Tassel 4" & Loop 3". Size: Tassel 4" & Loop 3". Weight: 23" gms per Piece. Size Tassel 8.5cms. & Ring 1cms. 1)Size Tassel 6.25" & Hanger 3". 1)Size Tassel 20cms. & Loop 9cms. 1)Size Tassel 2" & Loop 58". 1)Size Tassel 7cms. & Loop 2.75cms. 3)Material - Polyester & Bead. *Size Tassel7.5cms. & Hanger 2cms. *We make many produ.cts as Beaded tassel, Tieback, Coaster, Fringe, Napkin ring, Button, cords etc. 1)Size Tassel 6cms. & Loop 10cms. *Size Tassel 4.5" & Loop 4". 1)Size Tassel 12cms. & Loop 5.5cms. 1)Size Tassel 31cms. & Loop 9.75cms. 1)Size Tassel 2.5" & Mat 1"
*Size Tassel 10.5cms., Flower 4cms. & Loop 7cms. *Size Tassel 5.5" & Loop 4". 1)Size Tassel 5" & Hanger 3". Size Tassel 10cms. & Loop 10.5cms. Material - Rayon & Elastic. *Size Tassel 4" & Hanger 3"
Size Tassel 5" & Hanger 1.5". 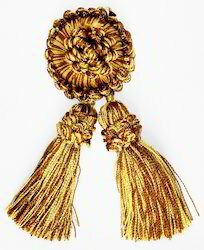 Looking for Ornament Tassel ?